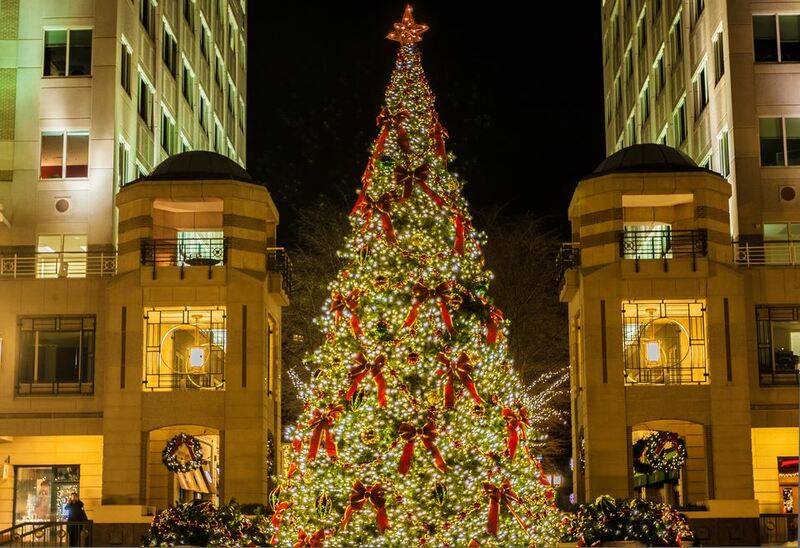 Located about 21 miles west of Washington, D.C., the town of Reston, Virginia is a great destination for family activities and attractions, especially during the holiday season when the Reston Town Center hosts its annual series of festive events. The Reston Town Center is a shopping center with more than 50 retailers, 35 restaurants, and a 13-screen movie theater. It is located at the intersection of Reston Parkway and New Dominion Parkway in Reston, Virginia. Starting with a kick-off celebration on the night after Thanksgiving, Reston Town Center will play host to numerous holiday activities in 2018, including a holiday parade, visits with Santa, a Christmas Tree lighting ceremony, and even a 5K race. You can celebrate Christmas all month long at these festive events in Northern Virginia. Featuring a fun-run and races for kids—toddlers through high school students—the Gingerbread Man Mile is a charity benefit event for Neediest Kids, a non-profit organization benefiting impoverished youth and families in the Capital Region. This free event will take place at 8 a.m. on November 23, 2018, but you will be asked to make a small donation if you choose to register to participate in the race. The first 500 people to register will receive an event t-shirt, and the winners of the races will get to participate in the parade that follows the event. Immediately after the Gingerbread Man Mile at 11 a.m. on November 23, 2018, the annual Reston Holiday Parade will march a half of a mile down Market Street from the Reston Town Center. Featuring huge balloons, special guest performances, dancers, musicians, antique cars, community groups, dignitaries, and various pop culture characters, this hour-long event also welcomes the arrival of Santa and Mrs. Claus to the Town Center. At least 60 groups and 500 participants are anticipated for the Reston Holiday Parade, including the Washington Nationals Racing Presidents and the winners of the Gingerbread Man Mile runs. After the parade, Santa and Mrs. Claus will stop by the Reston Town Center and set up shop near the Skate Shop and Guest Center for an afternoon of photo opportunities. For a $10 donation to the South Lakes High School Chorus, you can take home a portrait of you and your family with Santa's family. Individual children are also welcome to sit in Santa's lap to tell him about their Christmas wish list. Portraits will be available between 12:30 and 4:30 p.m., at which point Mr. and Mrs. Claus will take a break before returning in a horse-drawn carriage for the tree lighting event later in the evening. After a short break from picture-taking on November 23, 2018, Mr. and Mrs. Claus return to the Town Center at 6 p.m. to take a horse-drawn carriage ride down Market Street to Fountain Square, where the Reston Christmas tree will light up the area all season long. When the Clauses arrive, the tree will magically light up, immediately followed by a half-hour choral sing-along of traditional holiday music led by Reston Chorale and Brass Quintet. For more cultural entertainment at the Fountain Square that night, you can also arrive early for a 5 p.m. performance of selections from "The Nutcracker" by the acclaimed Conservatory Ballet. After the music stops, you can stick around to enjoy shops that will be open late or take a horse-drawn carriage ride yourself until 10 p.m. When it comes to getting in the holiday spirit, there's nothing like a horse-drawn carriage ride through snow-covered scenery or an afternoon spent gliding over the ice at a local rink. Fortunately, the Reston Town Center offers both throughout the holiday season in 2018. The Reston Ice Skating Pavilion is open for the winter season from November 5, 2018, to March 10, 2019, and will be open daily, including during holidays. The skating rink is located on the pavilion floor of the Town Center, but ice skates and supplies are available in the Information Center at the Skate Shop, which is directly beside the Pavilion behind Clyde's. On Saturdays and Sundays throughout December—as well as during the kick-off celebration on November 23, 2018—you can give back this holiday season by taking either a horse-drawn carriage or a mini-train ride through and around the Town Center. Horse-drawn carriage rides are scheduled for Saturdays in December from 4 to 9 p.m. All proceeds benefit local charities and rides cost $5 per person, but children 5 and under ride free with an adult. The departure point for carriage rides will be at 11900 Market Street, in front of Talbots. Meanwhile, on Sundays from noon to 4 p.m. from December 2 to 16, 2018, you can enjoy a train ride with your smaller children through the Reston Town Center. Donations benefiting local charities are requested (but not required) to ride, and the train departs from in front of Clyde's on Market Street. On Saturdays and Sundays from December 1 to 22, 2018, a variety of performances will grace various stages near the Reston Town Center for the "Holiday Harmonies" series presented by the Reston Community Center. Featuring both professional and local, amateur musicians, these special concerts and performances offer guests a great way to experience the rich musical culture of Reston and the Capital Region at large. You can view a full lineup of upcoming performances on the Reston Town Center official events page. Just in case the post-Thanksgiving Gingerbread Man Mile wasn't enough exercise for you this holiday season, the Run With Santa 5K event will return to the Reston Town Center on December 2, 2018, starting at 8:30 a.m. You can dress up in your finest Christmas elf costume or ugliest Christmas sweater to join in this annual charity event, which will start and end at Market Street at the Town Center.